Rummy Circle Tournaments are legendary and offers excitements to any rummy lover. If you are gamer who loves to play at Rummy Circle, you can enjoy this recurring jackpot tournament from Rummy Circle. You can enjoy seven daily jackpot tournaments everyday at Rummy Circle. You can enjoy these tournaments one in every hour! Yes it is unlimited fun time at Rummy Circle. You can play the whole day in free-roll as well as paid tournaments with minimum entry fee of Rs 1 to Rs 10! The Sunrise Jackpot Tournament is scheduled to be running every day at 7:00 AM. This will be a free roll tournament and the total prize pool of the tournament in Rs 4000. The first prize of the tournament is Rs 1000. You can register for this tournament from 5:30 AM to 6:55 AM. The Power Jackpot Rummy Circle Tournaments will also run on a daily basis. Similar to the Sunrise Jackpot tournament, this will also be a free roll tournament. The tournament will be running every day at 7:00 PM, the total prize pool of the Power Jackpot tournament is Rs. 7500 and the winner of the tournament will win Rs. 3500. You can register for the tournament from 4:15 PM to 6:55 PM. The Premium Jackpot Rummy Circle tournaments will be running twice every day. The two tournaments have different entry fee. The Premium Jackpot 1 tournament has an entry fee of Rs 1 and will be live at 11 AM. You can register for the tournament from 9:00 AM to 10:55 AM. The Premium Jackpot 2 tournament has an entry fee of Rs 3 and will be live at 9 PM. You can register for the tournament from 7:15 PM to 8:55 PM. The Loyalty Jackpot tournament will be running thrice a day. The Loyalty Jackpot 1 tournament has an entry fee of Rs 5 and will be live at 1 PM. You can register for the tournament from 11:15 AM to 12:55 AM and the total prize pool is Rs.2500. The Loyalty Jackpot 2 tournament has an entry fee of Rs 10 and a prize pool of Rs 3000. The tournament will be live at 4 PM. You can register for the tournament from 1:15 PM to 3:55 PM. 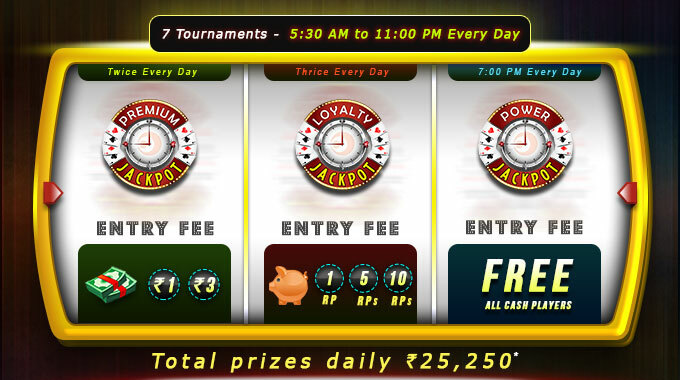 The Loyalty Jackpot 3 tournament has an entry fee of Rs 1 and will be live at 11 PM. You can register for the tournament from 9:15 PM to 10:55 PM and the total prize pool is Rs.2000. Do let us know how you enjoyed playing tournaments at Rummy Circle. Also let us know your reviews on the different tournaments hosted in the online rummy websites.